While a new era of supersonic airplanes remains a concept, bullet trains are a reality around the world—and they're getting faster. Spain's fastest train is the Velaro E by Siemens, and it is used for long-distance services to major Spanish cities and beyond: traveling from Barcelona to Paris can now be accomplished on high-speed rail in six hours. The distinctively futuristic white and silver of the Inter-City Express, or ICE, combined with its sharp red line, makes an impressive sight speeding through scenic German countryside. Similar to Spain's Renfe AVE train, Germany's fastest train is another Siemens design, the Velaro D, and was built to fit through the Channel Tunnel. This fact is important as DeutscheBahn hopes to operate these trains in the future from Frankfurt to London. Japan is celebrating the 52nd anniversary of high-speed train travel this year, since it was way back in 1964 that the Hikari train launched service between Tokyo and Osaka, cutting travel time between the country's two largest cities from nearly seven hours to a mere four by rail. The Hayabusa E5 series Shinkansen is one of the newer bullet trains on Japan's tracks, and so far the fastest in regular commercial service, running from Tokyo to Shin-Aomori at the very north of Japan's largest island, Honshu. This last March a new extension opened, allowing the route to continue north to Shin-Hakodate-Hokuto on Hokkaido but at a lower average speed of 160 mph. Connecting Amsterdam, Brussels, Paris, and Cologne with multiple daily services, the Thalys is one of Europe's most important train lines for both leisure and business travelers; in fact, its ridership is almost an even split between the two categories. In December 2015 the German route was extended as far as Dortmund, though the Brussels-to-Paris run remains critical, making up more than half the business. Tickets for the March 2015 inaugural run of this train sold out in 25 seconds, and it’s no wonder when you consider that the line’s debut cut travel times from Tokyo to Toyama and Kanazawa, over the "Japanese Alps" on the other side of the country, from four hours with a connection to just over two hours on a single train. Kanazawa, on the Sea of Japan, escaped damage in World War II and counts historic geisha districts, former samurai neighborhoods, and one of Japan’s most beautiful gardens as attractions. Before the train’s debut it was mostly a beloved destination for domestic tourists, but the E7 Shinkansen is finally showing foreign visitors that there are even more postcard-perfect cities in Japan. 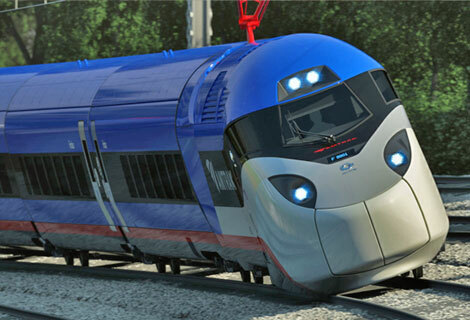 America’s current entry in the world of high-speed train travel, the Amtrak Acela debuted in 2000 and hasn’t changed much since, with the exception of adding complimentary onboard Wi-Fi. Its network is restricted to the high-speed rails of the “Northeast Corridor” connecting Boston, New York, Philadelphia, Baltimore, and Washington D.C., and traveling the entire length one-way clocks in at around seven hours due to some speed and infrastructure limitations along the way. By 2020, the west coast will have its own equivalent as Phase One of the California High-Speed Rail project connects San Francisco and Los Angeles with travel time of two hours and 40 minutes thanks to speeds up to 220 mph. Richard Trevithick, a British inventor developed the first full scale working railway steam locomotive in the early 19th century. It successfully carried six passengers to the next nearby village travelling at a speed of 8 km/h (5mph). A Japanese train reached 374 mph on a test track, covering 1.1 miles in 10.8 seconds and hitting a new world record.